Good news, pastry fiends: Simon & Schuster sends word that they’ve bought the first cookbook from Dominique Ansel, the man behind frozen s’mores, cronuts, and lots of other delicious pastries. The working title is Dominique Ansel: The Secret Recipes (which certainly implies that you’ll learn how to make cronuts in your very own home). But you’ll need to be patient: The book isn’t out until October 2014. Ansel, of course, was the pastry chef at Daniel for six years before leaving to open his own Dominique Ansel Bakery in 2011. The bakery was a hit before the cronut came along, but as everyone knows by now, the hybrid pastry changed everything (and probably upped the price of Ansel’s advance significantly). In any event, good news for Ansel and pasty lovers alike. New York, N.Y., Tuesday, August 20, 2013 - Simon & Schuster announced today the acquisition of Chef Dominique Ansel’s debut cookbook, DOMINIQUE ANSEL: The Secret Recipes (working title), which is scheduled to be published in October 2014. 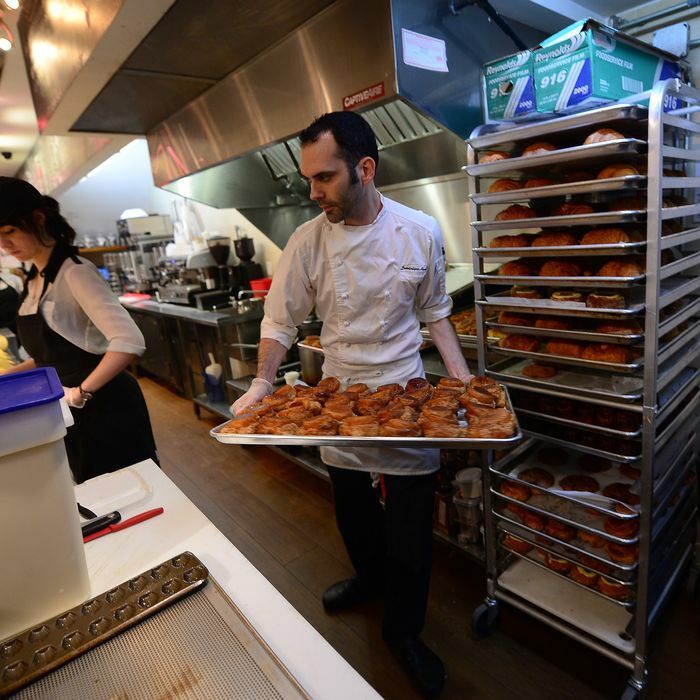 While many know him as the creator of the mega-popular Cronut™ (a croissant-doughnut hybrid), Ansel is no one-hit wonder: He was classically trained in Paris and spent seven years at the legendary patisserie Fauchon. From there, he earned acclaim in New York as the executive pastry chef at Daniel Boulud’s flagship restaurant, Daniel. During his six-year tenure, Ansel was part of the team that led the restaurant to receive 3 Michelin stars and its first 4-star New York Times rating. In 2013, Ansel was named a finalist for the “Outstanding Pastry Chef” award by the James Beard Foundation. DOMINIQUE ANSEL: The Secret Recipes will showcase Ansel’s artistry and versatility in a unique format: stories and commentary will guide readers through Ansel’s recipes, sources of inspiration, and favorite moments of surprise, which they can then take into their own kitchens to recreate Ansel’s most famous and elusive treats. It will teach novice and experienced bakers how to turn the simplest of ingredients (flour, sugar, butter) into the most extraordinary, tempting, and satisfying pastries imaginable—right in their own ovens. Simon & Schuster acquired North American rights, including first serial and audio, from Seth Fishman at The Gernert Company. The title will be available for pre-order at Barnes & Noble and Amazon.com.